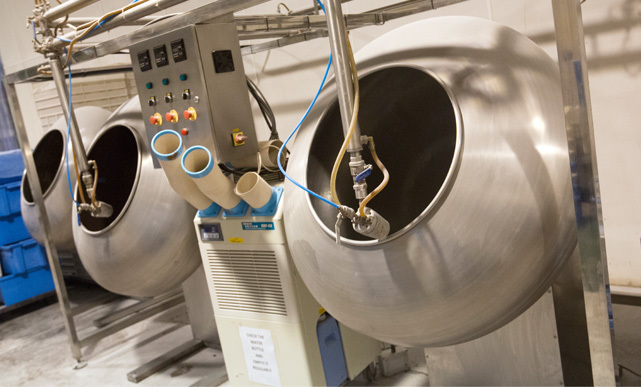 Our state-of-the-art coating and panning line, housed in a purpose built unit allowing for controlled climate and humidity, can offer customers unrivalled quality, innovation and service for all their coating and panning needs. Established in 1985, Sweetdreams Ltd; the creators of the chocolate confectionery Choc Nibbles range; based in Cramlington, Northumberland is a privately owned family business headed up by Matthew & Cath Stephenson. We pride ourselves on being a disruptive confectioner, renowned for our innovation, sound business and strong customer relations. Our management team has a wealth of experience, product and technical knowledge unrivalled in the confectionery industry. Andy Baxendale – star of the recent BBC documentary ‘The Sweet Makers’, Mike Flower and Mark Robinson come with over 100 years of combined chocolate making experience. Our panning operation offers endless possibilities in coated products. Using a wide range of quality, hand selected natural products to create a unique range of distinctively different confectionery products and value added ingredients for commercial application in the dairy, cereal, bakery and ice-cream sectors. Using the finest quality coatings including milk, dark and white chocolate, yoghurt and souring techniques using naturally coloured and naturally flavoured ingredients, Sweetdreams can coat, add colour, taste and and a multitude of textures to a vast array of materials. With an unrivalled team of in house confectionery experts Sweetdreams also works alongside customers to develop their own unique range of coated products. The company takes great pride in its ability to engineer technically advanced bespoke solutions. Sweetdreams Ltd also manufactures Choc Nibbles; a bestselling quirky and delicious range of chocolatey treats available in traditional sweet shops, independent retailers and leading UK high street discount stores. Available in Original Choc Nibbles, Toffee Crumble, Choc Lick, Mint, Jammie and Orange flavours, Choc Nibbles are loved by adults and children alike and are available throughout the UK! Chocolate coated nuts and dried fruits available in high quality milk, dark or white chocolate and yoghurt.